Like many of the saddlebags featured on our website, Viking has created a lineup specific to fit your motorcycle. 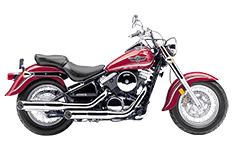 If you're a Kawasaki Vulcan 800 Classic owner and you've searched high and low for that perfect pair, look no further. We have a huge selection of saddlebags ready to mount on your motorcycle, so finding the right set is easier than ever before. From studded to plain, we cater to every rider imaginable. Check out each model for a more in depth look at what we feature!